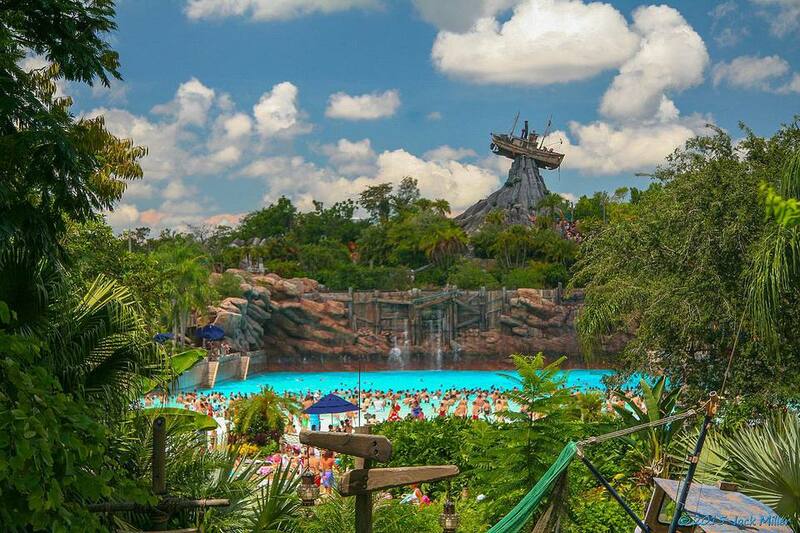 Disney World offers vacationers two world-class water park options, Blizzard Beach and Typhoon Lagoon. While these parks differ in style and theme, they both offer plenty of thrills and splashing fun for the whole family. The sheer size of the parks and number of offerings can be overwhelming to first-time visitors, but both parks are easily navigated and fun to explore. Make the most of your visit by brushing up on these Disney World water park tips, then get ready for tons of watery fun. Travel light: Wear your swimsuit and pack the bare essentials for each member of the family. Both water parks offer lockers, but the less you bring, the less you have to haul around and keep track of during your visit. Rent the basics: You can rent towels and life jackets at the water park, which is easier than bringing your own, particularly if you are using the Disney World transportation system. Get life jackets: Even kids that don't usually need a life jacket may be better off using one for the water park. It is not unusual to see older children wearing life vests, especially in the big wave pools. Watch the weather: Don't visit the park during a thunderstorm, you won't be able to enjoy any of the slides or pools. Consider visiting during a day that is simply overcast—the looming weather may keep many visitors away from the water park, drastically reducing wait times. Arrive early: If you plan on visiting Typhoon Lagoon or Blizzard Beach, do so first thing in the morning. You'll have time to set up in an ideal spot and be able to ride many of the slides with minimal waiting. Mark your seats: When you arrive, take a moment to select a place to sit, and place your shoes and other inexpensive but personal items on each seat to stake your claim. Chairs and lounges are claimed quickly, so if you wait until later in the day, you may find yourself without a seat. Check your timing: A Disney World water park is usually always open, no matter what time of year you visit; each park closes for a few weeks in the winter for refurbishment, so if you have a favorite, double check the schedule before you book your trip. Choose a meeting place: If you are visiting with kids, select a place in the park as a meeting spot if you get separated. Small kids can easily become lost in the busy water parks, and big ones will likely want to check in with you throughout the day. Prepare to wait: While most lines move quickly, neither Blizzard Beach or Typhoon Lagoon offer FastPass+, so expect to wait in line when you visit during the busy summer months. Choose a one-piece: Skip the bikini if you visit a water park! No matter how cute the suit is, it may not hold up to the more vigorous rides like the Humunga Kowabunga. Wearing a one piece ensures you'll arrive at the bottom of the slide with your swimsuit, not before it! Wear waterproof shoes: Wear Crocs or flip-flops to the park, and you won't have to worry about them getting sandy or wet. Some sections of the water parks have paved sidewalks, which get very hot in the afternoon; having waterproof shoes will help protect your feet without sacrificing your footwear. Wear sunblock: Even if you don't usually need sunblock, it is a must for any water park visitor. Between the hot Florida sun and the reflective water, it is very easy to get burned, which could ruin not just your day, but the rest of your vacation.